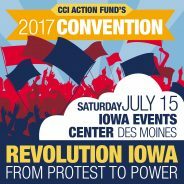 Today, members of Iowa Citizens for Community Improvement Action Fund (CCI Action) announced that Senator Bernie Sanders will deliver the keynote speech at their annual convention this summer. The July 15th event will be the first time that Senator Sanders has returned to Iowa since the 2016 election. In addition to his keynote speech, the convention will feature issue-focused organizing workshops, speeches from other movement leaders, and celebrations of CCI Action victories from the past year. Members of the public can register for the event here. Members of the press can register for the event here. Join as a CCI Action member today!